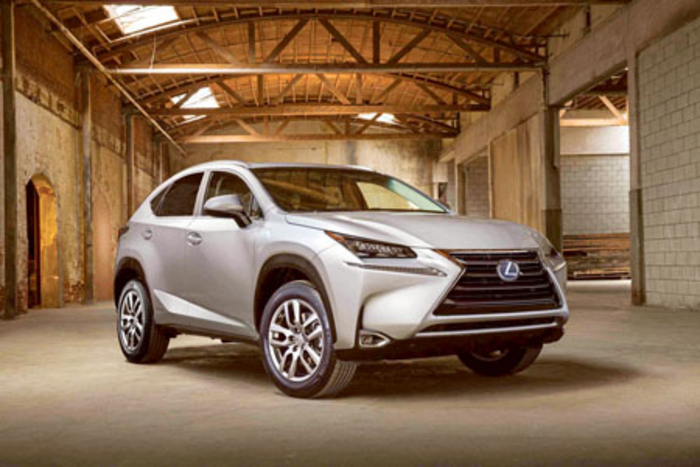 The all-new Lexus NX, a sharply styled mid-size premium crossover broke cover last week at the 2014 Beijing International Auto Show. The NX, Lexus’ first entry into the mid-size SUV market, has been conceived as an edgy, emotional design to appeal to new customers. With its striking design and high-end technologies, Lexus says that the hero model will set new standards for future models. Two LF-NX concept vehicles (LF stands for Lexus Future ) were introduced at the 2013 Frankfurt and Tokyo Motor Shows and received acclaim which substantially influenced the final design of the production NX. The NX has been designed to appear as though it was cast from one piece of metal, with bold flared wheel arches housing 17- or 18-inch wheels to provide a crouching, muscular stance. The angular shape uses Lexus’ aggressive signature spindle grille as its centrepiece reinforced by innovative LED headlamps and daylight running lamps. The spindle grille blends seamlessly into a sculpted bonnet, creating a strongly contrasting surface expression with a sense of depth. The side profile is instantly recognizable as a Lexus, accentuated by a roofline set towards the back of the vehicle for maximum visual effect. Lexus says that an innovative outer mirror and a world-first door handle mechanism with a hidden key barrel and integrated lighting add to the premium appearance by creating a smooth finish along the side of the vehicle. The rear is punctuated by Lexus’ signature ‘L’ shape combination lamps, each with seamless LED lighting. The bodywork echoes the spindle grille design at the front. Lexus says that the interior of NX brings a sense of excitement, with a design more like that of a sports car. With a highly sculpted dash panel, the NX interior complements the angular styling of the exterior. A thick-rimmed sports steering wheel conveys the dynamic capabilities of the NX, and contrasting interior trims add to the attractive design of the cabin. Interior space and seating played a significant role in cabin design. Intuitive interaction with the vehicle’s controls, instrumentation, and Human Machine Interface (HMI ) technology is at the heart of the interior design. The NX continues Lexus’ display and operation zone concept. The Lexus NX introduces a highly efficient petrol-electric hybrid in NX 300h offering the choice of front and all-wheel drive system. It will be available in Ireland with the full hybrid NX 300h powertrain. The NX has an array of innovative on-board technology, including a Lexus-first wireless charging tray to enable a portable device to be charged, the first application of a new Lexus Remote Touch Interface with a touch pad, panoramic view monitor and a comprehensive multi-information display including a Lexus-first G sensor and boost meter, head-up display, blind spot monitor, and rear cross traffic alert.